with mild winters and warm summers. The average temperature varies from 15 - 20 °C ( 59 - 68 °F). 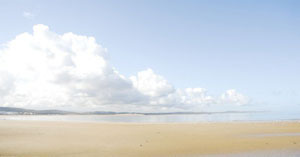 Maximum about 28 °C in the summer and not lower than 13 °C in the winter. The relative humidity from 81 - 89 % with peak in the summers. Rainfall between November and March. 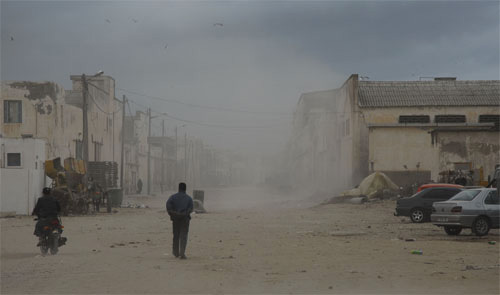 Theese North - East trade winds Charki, hit Essaouira sometimes violent , mostly in the summer and during the days. It is a pure atmosphere and the air is rich of oxygene and ozon. According to scientists with the EPA, susceptible people can be adversely affected by ozone levels as low as 40 nmol/mol. In the EU, the current target value for ozone concentrations is 120 µg/m³ which is about 60 nmol/mol. Afternoon summer mist at the beach north of Bab Doukkala. severe drynesses but also by devastating floods. Drought is a very common hazard in the region. 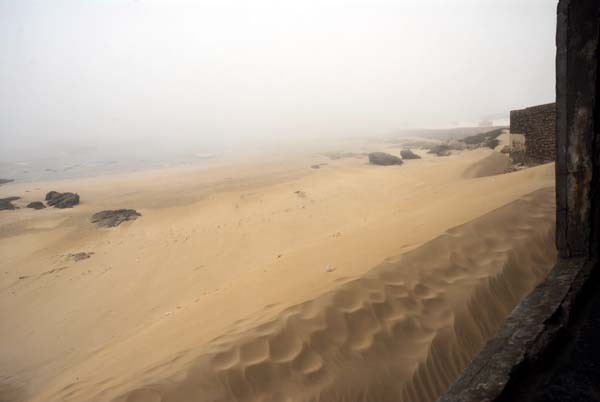 In Morocco, in the last 100 years, drought has occurred roughly once every three years. Winter is best for surfing. Thanks to the use of the meteorological model SWAN (Simulating WAves Nearshore), the waves (height, direction and period) can be predicted in the coastal areas. Maroc Météo cooperates with l’Organisation Météorologique Mondiale (OMM) and the Commission Océanographique Intergouvernementale (COI). 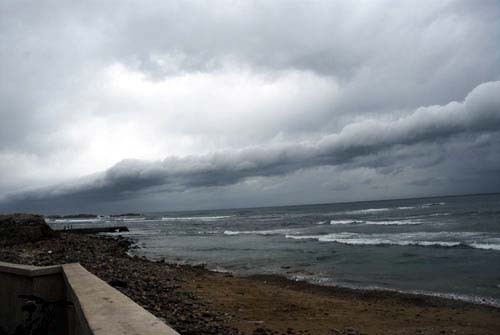 They give meteorological assistance to Mauretania,,Sénégal, Cap Verde and Congo.
" 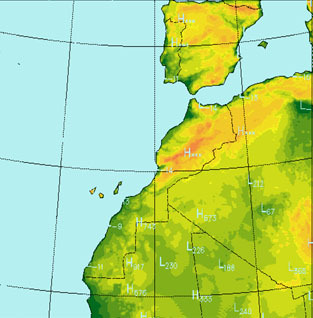 The climate of Mogador´s reputation among Europeans living in Morocco is more to do. Everyone knows the exceptionally mild winter temperatures and cool summers so pleasant. And this climate adviser tonic and invigorating, "rich in oxygen, ozone sake, with its strong presence of minerals due to salty air, the patients' rickets, swollen glands, local tuberculosis and lung, as at all depressed, overworked, nervous, convalescents seeking stimulants "
"A World Bank report published in 2009, predicts further significant changes in weather patterns. 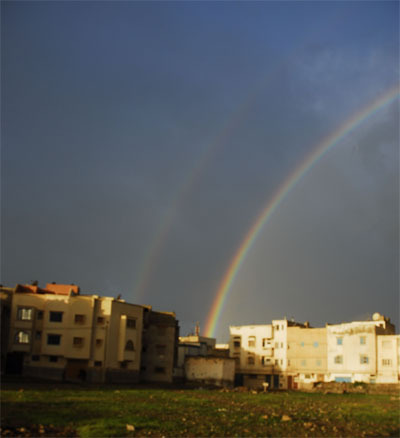 By 2050, rainfall in Morocco may be reduced by 20 per cent, with a 40 per cent drop possible by 2080." "A mix of climate change and deforestation (cut down for fuel and building) means that there is now less water and grazing for the herders. Just 30 years ago, things were very different. Much of the lower slopes were forested, largely with juniper trees. Barbary sheep (a goat-antelope creature with considerable horns) roamed the woodlands, as did wolves." “In the past there were trees, there was rain and if there was nothing to eat on the ground, the camels and goats could eat the juniper leaves." Source: Morocco's last Berbers on their 4,000-year-old annual migration: a tradition that is now under threat.